Some five hundred Nepalese gathered in Kathmandu as the Office of the Prime Minister and Council of Ministers awarded the Global Peace Foundation (GPF)-Nepal on August 6, 2015 for its continuous efforts in rehabilitating Nepal's main waterway, the Bagmati River, through the Bagmati River Clean-up Mega Campaign. The Chief Secretary of Government of Nepal, Mr. Leela Mani Paudyal, presented a certificate of appreciation to Ram Rohan Panta, President of GPF-Nepal, as well as other representatives of organizations that are spearheading the campaign, a joint initiative of the government, private sector, communities and NGOs established on May 18, 2013. Chief Secretary Paudyal congratulated everyone and stressed that through their joint efforts, the Bagmati River could be restored and preserved for future generations. Global Peace Foundation-Nepal has been organizing massive cleanings of the Bagmati River as well as waste management and public awareness programs since 2010 to tackle the river’s growing pollution problem through the Rivers of Peace Campaign, a network of innovative and responsible individuals, families, clubs, societies and organizations committed to restoring in-city rivers through taking ownership and action. The Bagmati River is the largest waterway in Kathmandu Valley, comprised of 57 tributaries and rivulets running through the country’s capital, Kathmandu. The river is still seen as sacred, and Nepalese continue to bathe in its waters and cremate along its banks. The Bagmati today is incredibly polluted, facing a number of serious environmental and ecological challenges. Hardly any aquatic life remains as sewers are dumping municipal and hospital waste directly into the water. Some other key contributors to the pollution are increasing population, direct disposal of untreated sewage into the river, uncontrolled sand mining, improper solid waste disposal, rapid construction of industries and uncontrolled squatter settlements (Friends of Bagmati). As of now, GPF-Nepal has mobilized a network of more than 20,000 volunteers for the cleaning campaign. The campaign is not only aimed at restoring the river but raising young leaders to be aware of the critical need to maintain a clean environment and take up a culture of service and ownership over the river. GPF-Nepal volunteers have committed to regular cleanups at a 1 kilometer section of the Bagmati River and its banks, from Guheshowari to Pasupati Barmanal. 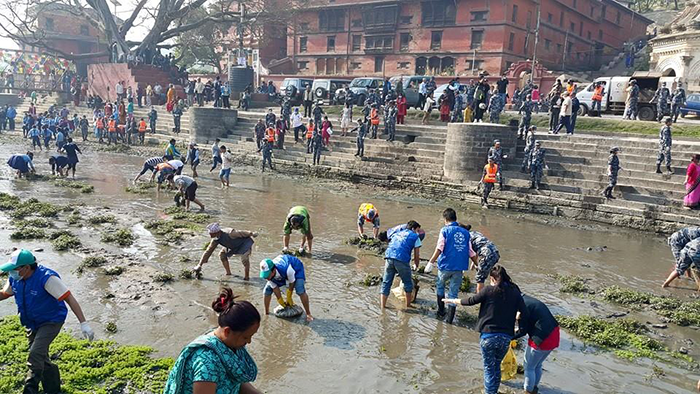 Several other organizations taking part in the Bagmati River Clean Mega Campaign have also dedicated to regular clean-ups of specific upstream sections of the River. GPF-Nepal believes a multi-faceted approach is necessary to create a sustainable solution; thus it provides a platform for experts, scientists, academics, dedicated citizens and organizations to discuss, plan and organize activities to revive the river. The Global Peace Foundation and its many partners will continue to spread awareness and support the restoration of this essential water source.